Preheat your oven to 350°. Add enough oil to coat the bottom of a sauce pot and heat over a medium flame. Roast the ribs on each side until nicely caramelized. Remove the ribs and drain off any excess fat, retaining a tablespoon in the pot. Add the carrots and cook until golden, then add the onions and celery. Cook for 3 minutes, then add the tomato paste. Cook for a minute, then add the port. Reduce the port by half, then add the ribs, beef stock, and the spices. Bring the stock to a simmer, then cover and braise in the oven until tender, about 90 minutes. Remove from the oven and let the ribs cool in the stock. Add enough oil to coat the bottom of a sauce pot and heat over a medium flame. Add the beets, cabbage, onion, garlic, salt, and caraway. Season the vegetables with a pinch of salt and cook, covered, for 15 minutes. Add the port and vinegar and reduce by half. Add the short rib braising liquid and bring to a simmer. Cook the soup, covered, for about 20 minutes then blend. 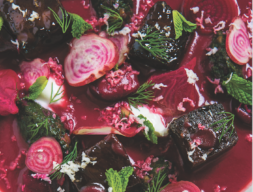 Season the borscht with salt and additional balsamic to your taste. Thin with a little water if needed. Preheat your oven to 350°. Combine all the ingredients in a baking dish. Cover with aluminum foil and bake for about 45 minutes, until the beets are tender. Remove from the oven and allow to cool slightly. Using a piece of paper towel, slip the skins off the beets. Slice in half and reserve. Bring a pot of salted water to a boil. Cook for 45 seconds and then add the beet greens, parsley, and spinach. Cook for an additional 45 seconds, then strain out the vegetables and run them under cold water to cool. Squeeze out the greens until they are dry. Chop the greens and capers, and then mix with the olive oil and lemon zest. Place the short ribs and braising liquid in a sauté pan and bring to the boil. Reduce the heat and continue cooking until the liquid is reduced to a syrupy glaze. Roll the ribs around to coat. 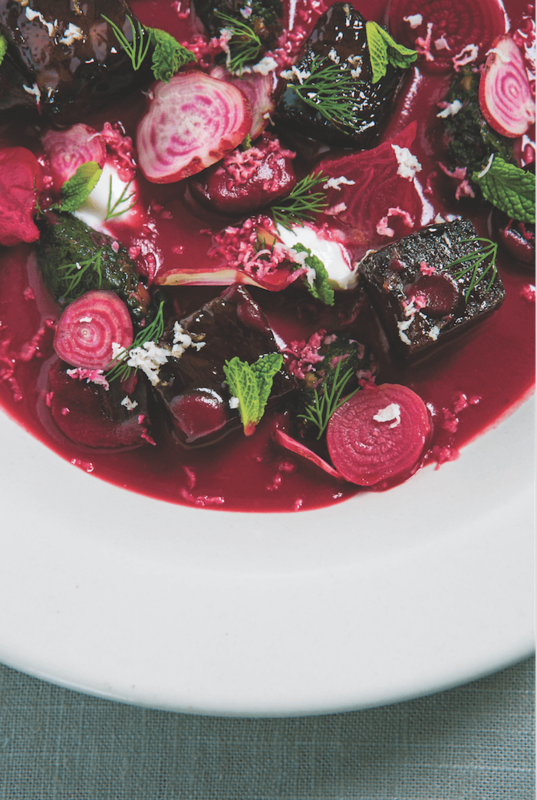 Place the roasted and raw beets and beet tops in the bottom of a bowl. Evenly divide the glazed short rib pieces then top with crème fraîche, mint, dill, and grated horseradish. Heat the soup and serve.